Aligned with Kohl for Kids’ theme “Music Moves Me” Sound Impact’s newest education program leads the students through an interactive time travel adventure. This engaging new program spans music from 1263 to 2018, and takes students on a journey to meet composers in their hometowns throughout the US and around the world. Connecting with poetry, nature, historical and cultural context, this program travels through time and space, exploring the evolution of music through the eyes of a string trio. 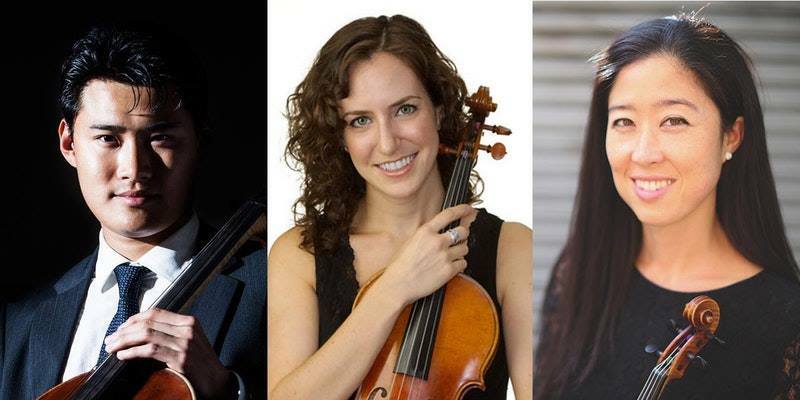 Featuring violinist Rebecca Jackson, violist Tiffany Richardson and cellist Katie Youn. This program is made possible by Music at Kohl Mansion. Sound Impact is honored to be a part of the Inaugural WoCo Festival, presented by the Boulanger Initiative. The Boulanger Initiative’s mission is to work towards greater inclusivity, and to enrich our collective understanding of what music is, has been, and can be. Sound Impact is proud to bring voices to these women composers. Omnifarium: Spanning centuries, continents, strings, keys and brass, Omnifarium seeks to bring unlikely pairings of sounds and content together in a harmonious and unexpected way. Images of the Welsh sea from Grace Williams and Auerbach’s mountains of Siberia elide into the meditative melodies of Hildegard, juxtaposed with Libby Larsen’s poignant memoriam to the lives lost in 9/11 brings a new, inspiring look at chamber collaborations. Join us for the Second Annual Play In: produced by Sound Impact in association with Music at Kohl Mansion! After a brief performance by Sound Impact, experience one of the great joys of being a musician and meet new friends at a chamber music reading party. Students, music hobbyists and professional performing artists are encouraged to bring their instruments to join in the fun! We will have some standard chamber music on hand. Bring your favorite sheet music and a folding stand if you wish. Whether or not you play an instrument, please join us for a great evening of music and community! RSVP is required, register here! Alma Ensemble and Sound Impact are collaborating to bring you a concert for the community! Spend an hour enjoying music together. Sound Impact returns to Roanoke for their second Education Residency with the Roanoke Symphony Orchestra. The students will learn about a bear named Ben, as we explore themes of embracing our differences and staying true to ourselves. Sound Impact’s newest education program inspires self-esteem for even the youngest audience member. This engaging new program explores themes of embracing our differences and staying true to oneself through the story "The Trouble With Ben" (music by composer D.J. Sparr, lyrics and story by Grammy award winning writer Barry Louis Polisar) and the timeless music from West Side Story (arranged by John Wineglass). This program features interactive games to deepen the experience and understanding of these string instruments and new sounds and textures of contemporary music brought to life by a string trio. Sound Impact’s newest education program inspires self-esteem for even the youngest audience member. This engaging program explores themes of embracing our differences and staying true to oneself through the story “The Trouble With Ben” (music by composer D.J. Sparr, lyrics and story by Grammy award winning writer Barry Louis Polisar). Featuring violinist Anne Donaldson, violist Tiffany Richardson and cellist Danielle Cho. Petite Holiday Benefit Concert in Wheeling! Give the gift of music! Join Juan Jaramillo and Sound Impact for an evening benefitting Sound Impact's second International Music Festival in Costa Rica. The evening will feature a special musical performance by Juan and Robert Troeger. Light refreshments and libations will be served. Join us to support and celebrate our 2018-19 season. Enjoy a special evening in Honeywell’s state-of-the-art Technology Center with a stunning Capitol view. Hors d’oeuvres, libations and silent auction will round out the evening’s musical program. Their outreach at Brook Knoll Elementary will be for the special needs students, most of which are non verbal, each requiring their own caretaker. SI will perform its newest commission "The Trouble with Ben" featuring music composed by D.J. Sparr and lyrics and story written by Grammy award winner Barry Louis Polisar. Sound Impact performs on McLean Project for the Arts new Art + Music Concert Series. This outdoor performance is perfect for the whole family, and features "The Trouble With Ben" (music by composer D.J. Sparr, lyrics and story by Grammy award winning writer Barry Louis Polisar). Join us to learn about a bear named Ben, as we explore themes of embracing our differences and staying true to ourselves.